NORWOOD– On Friday April 22nd Northeast Championship Wrestling and the 2016 Season return to the Elks Lodge in Norwood, Massachusetts (152 Winslow Avenue) for the NCW Friday Night Fights! Doors open at 7pm with a 7:30pm bell time, tickets are on sale $10 for adults and $5 for kids twelve and under. Tickets can be purchased online at theNCW.com/tickets and will be available at the door the night of the event. On December 14th, 2013 NCW’s 2013 Season finale WrestleFest IX was postponed until February 2014 due to a snowstorm that hit the Northeast and crippled the area. On February 7th, 2014 Northeast Championship Wrestling finally concluded its 2013 year with WrestleFest IX live from the Norwood Lodge of Elks. WrestleFest IX would see the 2013 Big City Rumble winner “RIOT” Kellan Thomas finally get his shot at the NCW Heavyweight Championship against NCW’s Triple Crown Champion Scotty “By GOD” Vegas (Alexander Lee) while Dean “The Beast” Livsley fought for his job against NCW Commissioner “Dastardly” Doug Summers with NCW Ownership on the line. Relive all the great moments from that night directly from our YouTube channel as we prepare for our 2016 kickoff Feb 19th in Norwood and February 20th in Dedham, Massachusetts. 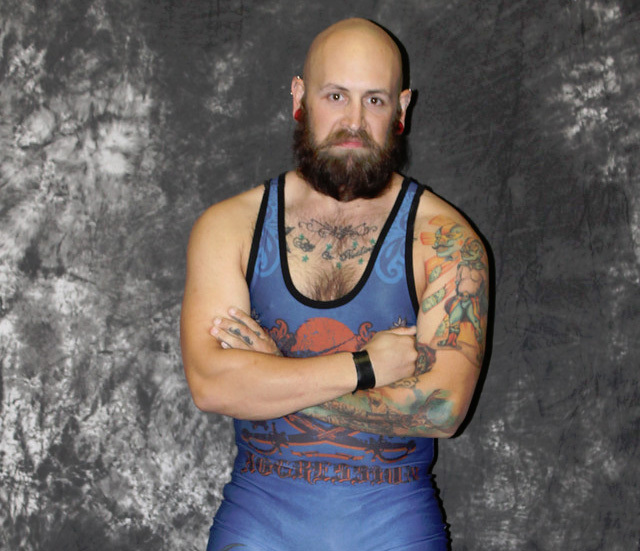 This past Friday night Northeast Championship Wrestling presented the final event of our 2015 Season with WrestleFest XI- a huge night of wrestling action featuring 3 Championship Matches, the Ox Baker Memorial Cup, and the shocking unmasking of “RIOT” Kellan Thomas’ masked assailant. Who Is The Masked Man? It was at the 2015 Big City Rumble this past August when a mysterious Masked Man came out of nowhere during the Ladder Match between NCW Champion “RIOT” Kellan Thomas and Triplelicious, shoving Thomas off the ladder seconds before retrieving the NCW Heavyweight Championship belt. In the moment many believed that it was just another enforcer working for Triplelicious, but it was soon apparent that this agent of chaos had singled out Kellan for other reasons, costing Thomas the Championship the following month at NCW FALLOUT against “Ruthless” Ruy Batello. At WrestleFest XI “RIOT” finally gets The Masked Man one on one and face to face, but the question still remains… Who is he? BREAKING NEWS: Scotty Vegas Injured! Officials have just received word that NCW’s first ever Triple Crown Champion “The Maine Event” Scotty Vegas has been severely injured while leaving his home in Bangor, Maine with just days to go before WrestleFest X and his shot at the NCW Heavyweight Championship. Vegas defeated NCW Champion “RIOT” Kellan Thomas in a non-title match at NCW NO FEAR last month to earn a place into the Championship Scramble featuring the 2014 Big City Rumble co-winners “Simply God’s Best” GA West and the Lumberjake. PRESS RELEASE: NCW’s 2014 Finale November 28th! 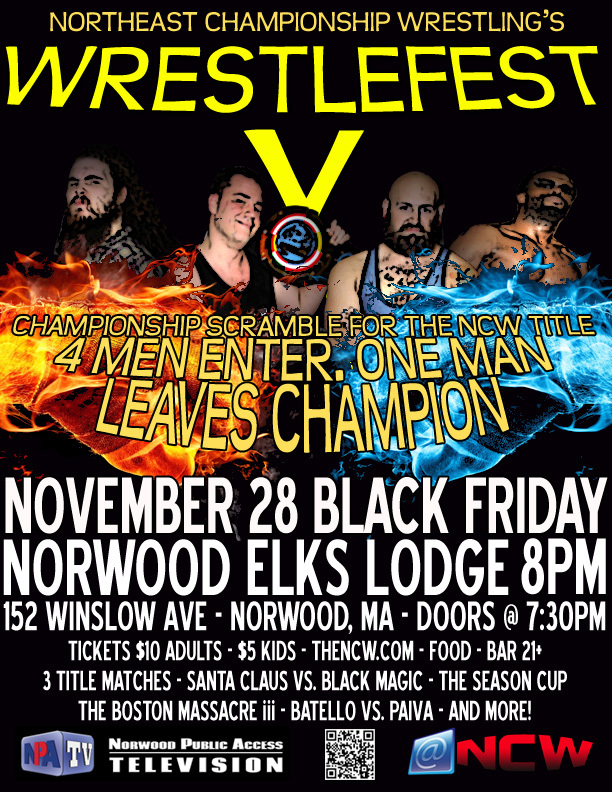 NORWOOD– On Friday night November 28th “Black Friday” comes to Northeast Championship Wrestling when we present the final event of our 2014 Season with NCW WrestleFest X live from the Norwood Lodge of Elks located at 152 Winslow Avenue in Norwood, Massachusetts. Sponsored by our friends at Papa Gino’s Pizza doors open at 7:30 with an 8pm bell time. Tickets will be available at the door $10 for adults and $5 for all kids twelve and under! 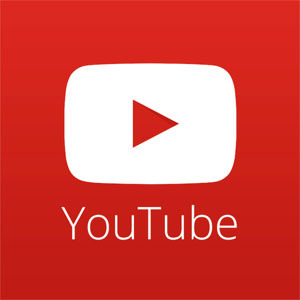 @NCW Television comes to you courtesy of Norwood Public Access (Verizon Channel 35/Comcast Channel 8) bringing all the characters, excitement, and wrestling action from the ring right to you! New episodes air every two weeks check your local listings, and for those outside of the Norwood, MA area keep up to date with episodes here on theNCW.com. 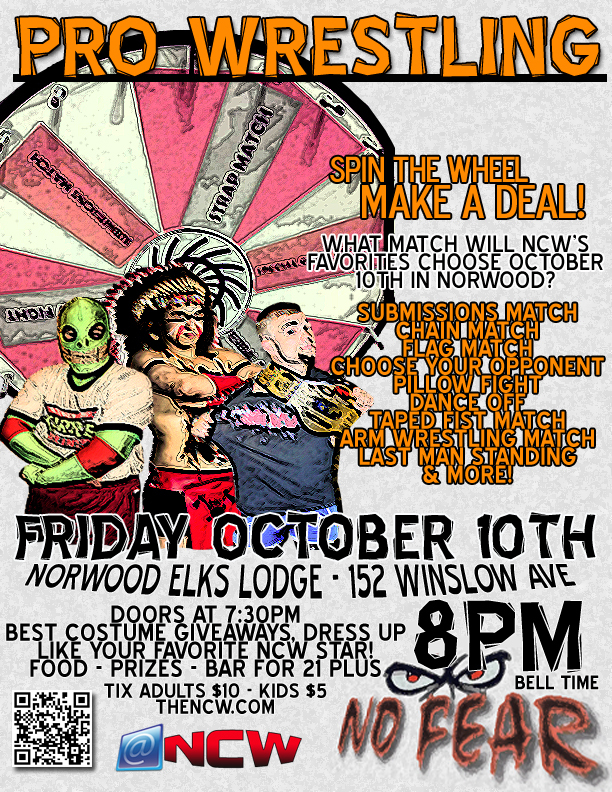 This past Friday night Northeast Championship Wrestling returned to the Norwood Lodge of Elks for our annual Halloween event NO FEAR, featuring the spin the wheel, make a deal roulette wheel. In the night’s Main Event NCW Heavyweight Champion “RIOT” Kellan Thomas faced off with “The Maine Event” Scotty Vegas with Vegas earning a spot into the WrestleFest X championship match. A BIG thanks goes out to our sponsor for the evening Papa Gino’s (located at 142 Nahatan Street in Norwood) for helping us spread the word and bring us into the Norwood community. 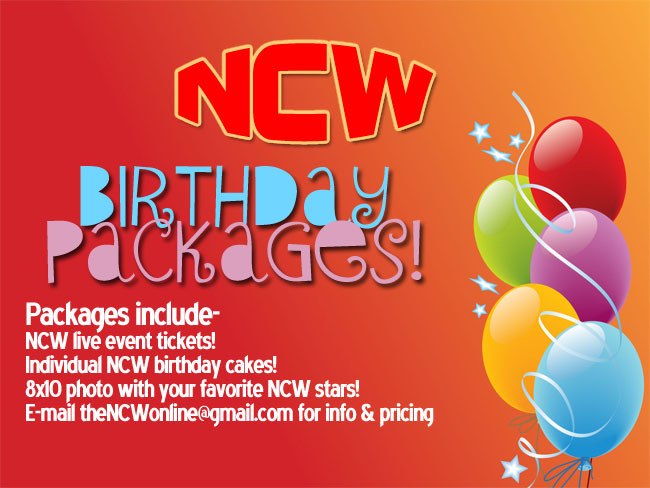 PRESS RELEASE: NCW Returns to Norwood October 10th! 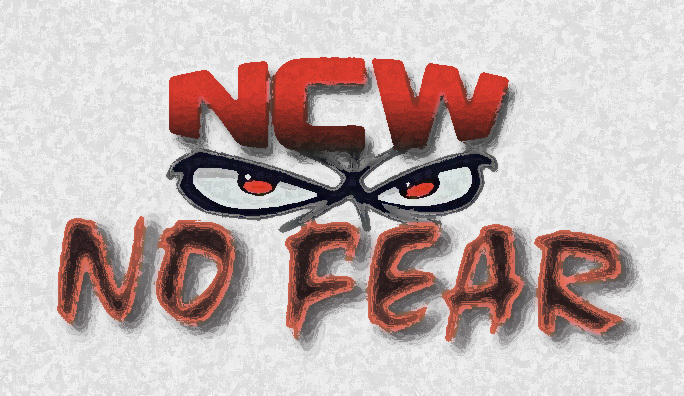 NORWOOD– On Friday night October 10th Northeast Championship Wrestling continues its 2014 wrestling season when we present our annual Halloween Spooktacular NO FEAR live from the Norwood Lodge of Elks located at 152 Winslow Avenue in Norwood, Massachusetts. Being NCW’s Halloween affair, we’re encouraging our fans to dress up in costume as we celebrate one of our favorite events of the year. Sponsored by Papa Gino’s of Norwood, doors will open at 7:30 with an 8pm bell time and tickets will be available at the door only $10 for adults and $5 for all kids twelve and under.